Yesterday I went scurrying out to my car, on my way to work, and discovered it was completely covered in fine white flakes. At first I thought the kids in the neighborhood had done something to it (I don’t know why I automatically assumed that) but then after a closer inspection, I realized it was ash. 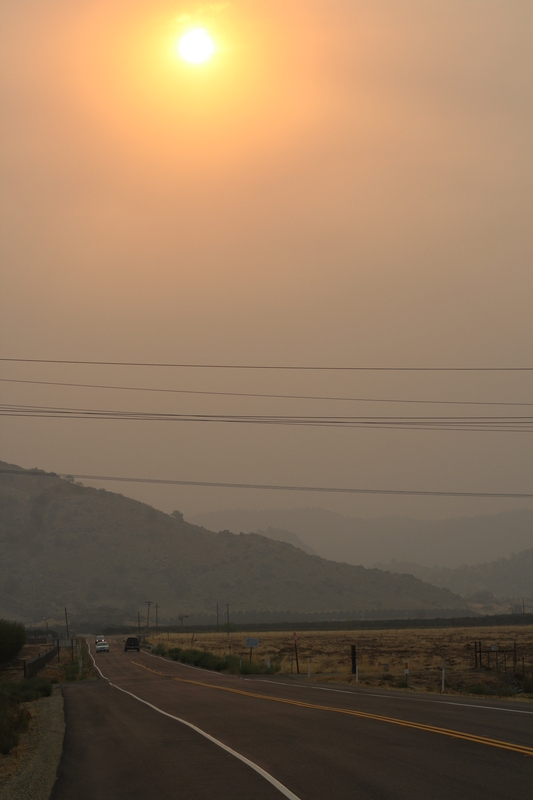 The air has been filled with smoke, and it wasn’t until I felt the burning in my lungs and my throat, I remembered there was a huge wildfire, named the Rough fire, burning with ferocity not more than 45 miles from our house. I never look at the news, but searching for information regarding the fire up in the Kings Canyon National Park has drawn me to the local news websites. I learned this is an enormous fire. Because of the unrelenting drought over the last several years, the forest is dry, filled with dead and dying trees which is just fuel for the fire, so to speak. There is currently 128,796 acres involved, making it the largest active fire in California (http://inciweb.nwcg.gov/incident/4456/). 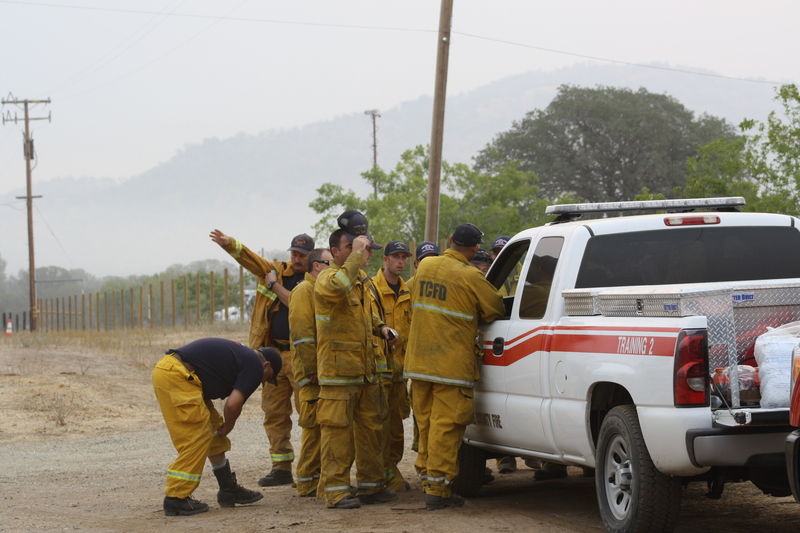 There are 2,570 personnel assigned to this fire detail (09/12/15). These are impressive statistics, but don’t really mean much when one is scanning the news. It didn’t really mean much to me either, until this morning. I had decided in some ice cream deficient moment last night that I was going to go on an adventure this morning to see if I could get some photos (safely) of the fire and share them on my little blog. As with all my journalistic adventures, I went out to obtain information about one thing and came back with a totally different perspective. I left the house really early, around 5:45AM and travelled directly east. 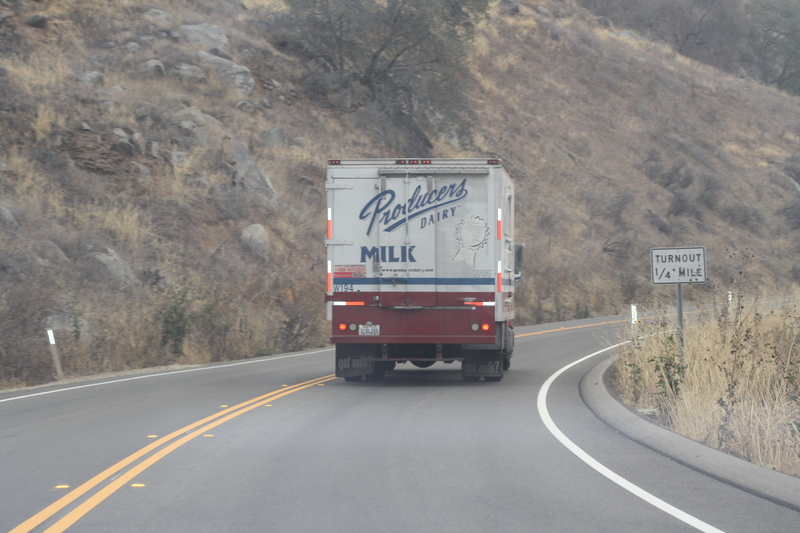 I became a little nervous as I got closer, but decided to follow a milk truck in, as he was going the same direction. I figured if it was safe enough for a milk truck, it was safe enough for me. As we started to climb into the foothills, my apprehensions grew as the smoke became thicker and the foothills more hazy. I no longer saw any cars coming the opposite direction. The milk truck and I rounded a bend and in front of us was a lighted sign stating the road was closed up ahead. The milk truck continued, and so did I. We went over a little hill and around a final bend. That’s when I saw the flashing red and blue lights of the police cars up ahead. I knew I couldn’t go any farther. 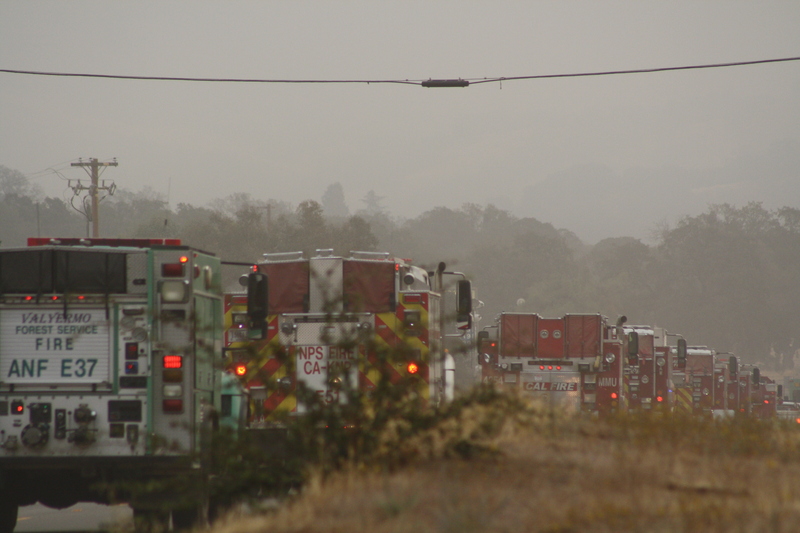 But then I noticed to the left of me, a field with what must have been hundreds of fire trucks and water trucks. An orange sign on the side of the road said “Incident Base”. I parked my little car on the opposite site of the road in a clearing, away from all the activity. I sat there for a moment debating as to whether or not I should get out of the car, but I had driven so far and didn’t want to go back home without any photos. 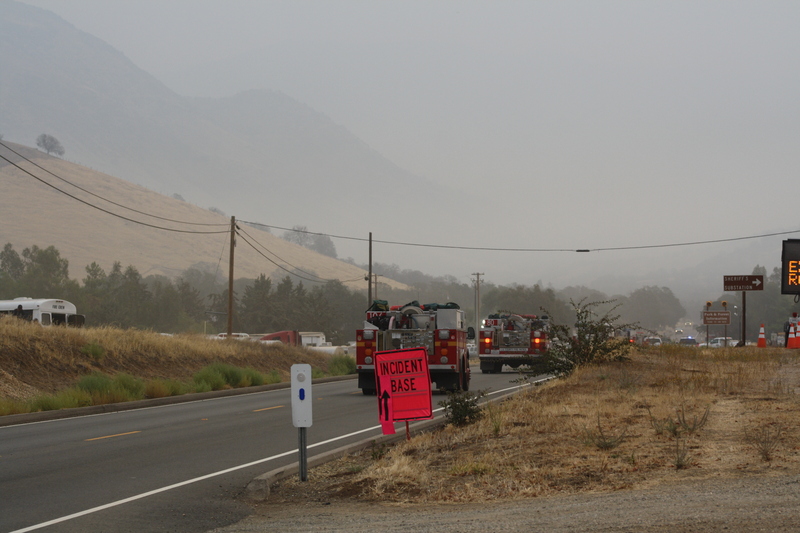 As I climbed out of my car, a truck with firefighters pulled into the clearing right in front of me. The two firefighters got out of their truck. After a very heated conversation with myself and chewing nervously on a hangnail, I went over and talked to the man with the rolled of papers under his arm. 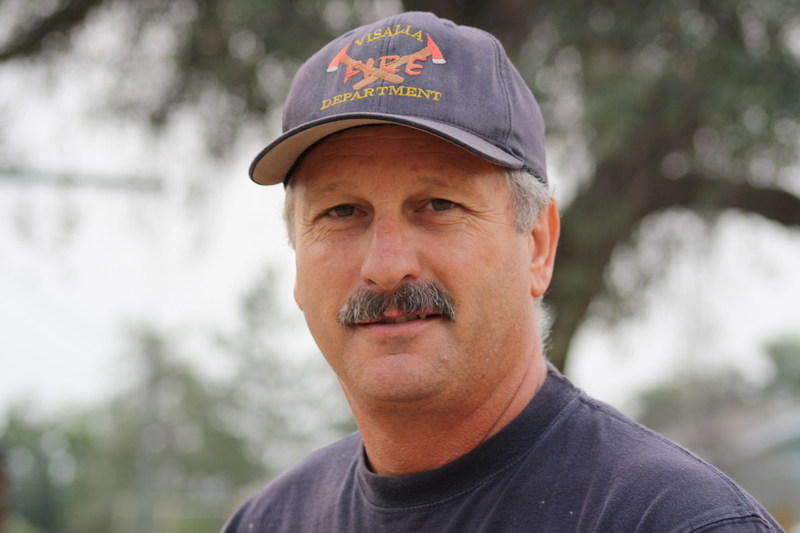 He was dressed in a blue uniform, with a baseball cap that had Visalia Fire Department written on it. I told him I had foolishly thought I could just pop over to the foothills and photograph the fire from a distance for a post on my little blog. He looked down at me and smiled. He said I could probably go up a little further to the next clearing and get some decent photos. 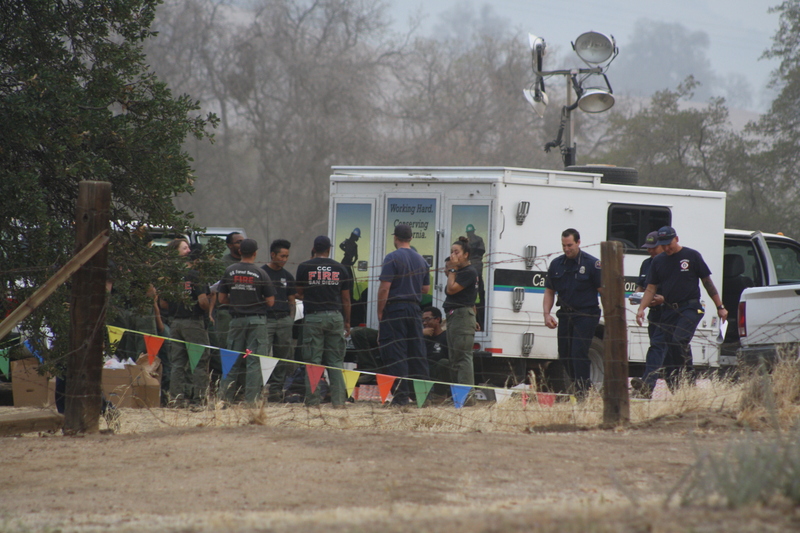 I said I didn’t want to get in anyone’s way, and that I had no idea that all of that (I pointed to the activity across the road, in the field) was required to fight a fire. One never thinks about the logistics in battling a large fire. I told him, the news never shows all of that, the fire trucks, the planning and the personnel involved. We just hear about acres involved, land burned and percentages of containment. He told me there were 2500 firefighters assigned to this particular fire. The fire fighters come from all over. They work 12 hours on and 12 hours off. The firefighters slept and ate (hence, the milk truck – I said that, not Joe) over in the field across the road. He unrolled his maps and showed me the two places where Incident Bases had been set up. He said he and the crew he works with had just come from another fire directly south of where we were standing. I shook my head slowly in astonishment and I said again I had no idea. He told me Kings Canyon National Park contains Grant’s Grove, where some of the trees are over 3000 years old, and so the park has been somewhat coddled. Add to that, the drought has completely stressed the trees and so there is a lot of dead trees and debris, only adding another level of difficulty to the fighting of this fire. When I stood near General Grant (the tree) in 2007 – I was overtaken with emotion, in considering the history which must be contained in every cell of that tree. I then asked him if he was ever scared when he went into fight these huge fires. He replied, “I’d be stupid not to be scared.” I let that comment sink in as I stood there and watched the activity across the road. Other trucks began to pull in and around my car in the clearing. I realized it was time for me to leave. I thanked him wholeheartedly for taking the time to talk to me and give me a “ground zero” point of view and putting a completely different perspective on the “bird’s eye” view we normally get from the media. I asked him his name. His name is Joe Goforth. What a splendid name. He let me take a photo of him for my blog post. He was such a nice fellow who took the time to talk to me, answer my questions and put a face to all the people that leave their families and spend days and weeks out in challenging, potentially life-threatening conditions to keep the rest of us safe. I must have timed it just right, because apparently it was change of shift. 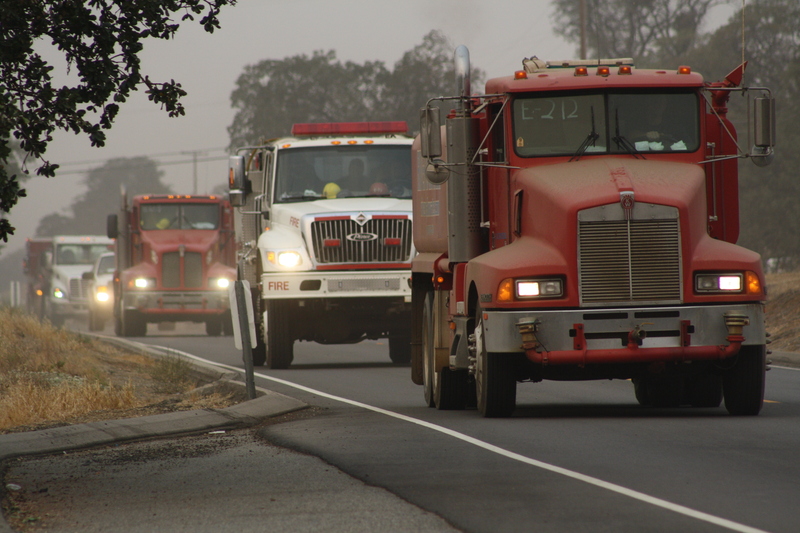 With a sudden jaw-dropping burst of activity, the trucks began filing out of the field across the street and one after another they began their trek towards the fire. An unbelievable amount of machinery and firefighting personnel, seated inside the trucks, passed by me. These individuals are not statistics, these are the people that go in to an area the rest of us would instinctively run from and spend 12 hours fighting a fiery, unpredictable monster. These are amazing people, these firefighters. I went home and spent several hours whacking down plants in my overgrown garden. I was hot and the sweat was rolling down my face from behind my ears. The weather was sweltering, about 100 degrees. I was dressed in a t-shirt and shorts. When I could take no more, I went inside to clean up. It was about 3:00PM. I was still thinking about Joe Goforth and all the thousands of firefighters out there, dressed in their gear, with at least 4 more hours left on their shift. I wondered how they did it. In my mind, I thanked them for doing what they do. Thanks to Youtube for the video on Kings Canyon National Park! All to often the men and women who keep us safe like firemen, police and ambulance/paramedic crews, not to mention the military, are forgotten about as individuals and become a statistic for the media. Like you said in your post, 2500 individuals were working in appalling conditions and risking their lives to keep the public safe. Thank you so much for reminding me (and others) that a whole bunch of people are out there doing this. They are amazing people. As I said, I had no idea, until I stumbled upon all this other day. Really mind-boggling that there are still people out there that put themselves in the face of danger with no expectations of a thank-you!!!!! Impressive post. My hat is off to those brave men and women who battle day in and day out to preserve Gods landscape, the lives and homes of complete strangers and do it every day. Thank you. Thank-you Sheila!!!! I really learned a lot yesterday. Oh I love this-you put faces on the statistics where the media glorifies celebrity over every day hero. Thank you to all who are helping in your area! Stay safe Sparkly Pants! Really, an excellent article! You have put a face on this awful travesty, thank you! I wish, hope,pray the drought ends. Hi Solveig!!!!! Thank-you so much!!!!! I will. I am safe and sound in my little house. Wow. Seriously, just wow. Great piece. Really great post, SD. Thanks for bringing the heart of it to your blog. You’re right, the news media does not do that. Thanks to Joe, too. I love his last name. We had a rainy season and dry season in Florida. During the dry season there was usually a brush fire somewhere. Occasionally, we’d step out our door and smell the smoke. Once or twice it irritated our eyes. We never experienced something as devastating as what you’re seeing out there. God bless those firefighters, and may the fires be quelled. Stay safe. Thanks Lori!!! Hope all is going well with you and your family!!!! Wow, 2500 people. Thanks for taking the time to take photos and gather this information to share. You are welcome. I checked the inciweb site today and they said there are over 3,000 people fighting this fire now. This is really thoughtful of you to glorify the real heroes we have!! Your journalism actually upheld the ethics of the profession coz otherwise these days…..media is full of useless stuffs. They are amazing people, firefighters. Living in Australia for many years we had our share of big bushfires, and the smoke and ash does fill the air for miles around. It’s a very tough job and they are real heroes, that’s for sure. Luckily the ash and the smoke have gone, the air is much clearer today. I just read the Incident update – it sounds like the firefighters have the majority of it under control and they will start opening up the park again. Hopefully, the weather will stay cool for them as they start the clean-up process. That’s good to hear – thank goodness the weather is co-operating! I still remember how it felt on Black Saturday in Australia. I walked down my garden and it was like being inside an oven, the heat stifling and the air swirling strangely around me. Those conditions led to the inferno that claimed so many homes and lives – a ‘perfect storm’ of a fire. I remember when I went to boarding school in Australia, we had a bush fire. It was very scary – we all stood on our beds to look out the window and the Matron came and shouted at us to get back in our beds. We thought we were all going to burn up, and we thought she was a monstrous meanie for not being more concerned about the fire and our well-being. Great post- I’m not living anywhere near the fires, but I listen to a lot of news about them on NPR- so crazy, it’s so horrible to hear about the loss of some of the firefighter’s lives- I honestly can’t imagine being brave enough to do what they do. I don’t think I could be that brave either. 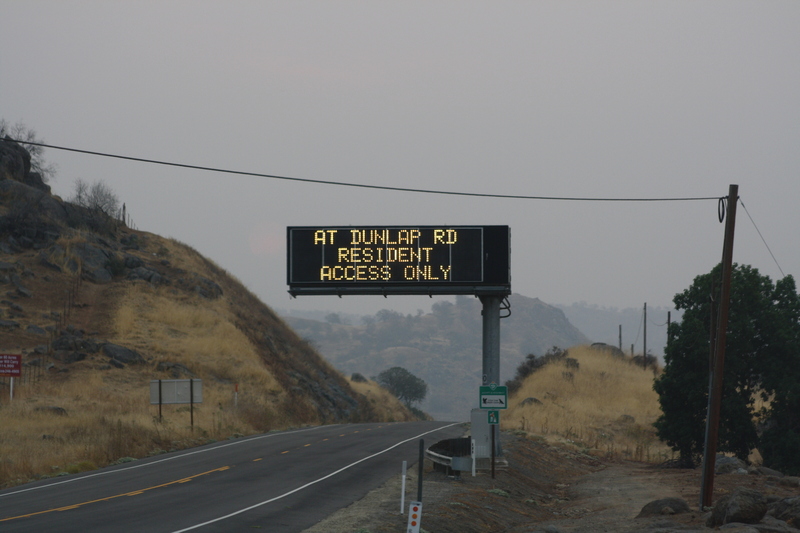 I was scared to death just to drive anywhere near the smoke and the falling ash, I can’t imagine going into the heart of it, with flames, and falling tree limbs and the unpredictability of a fire. It is amazing to hear of others selflessly putting themselves into the path of danger for others, in this day and age. Wow, it was so great to meet you today. I enjoyed reading this article. Hi Cyndee, it was great meeting you too. Thanks for saving me from the shoe shine stand. Thanks for taking the time to come visit my little blog!!!! This is an excellent post. These fires are heart-breakers. You really bring it up close and personal with your accounting. Thank you. You are welcome and thank-you for coming to visit my little blog!!!!! That was very interesting. I had no idea they worked 12 hours on 12 hours off fighting fires. Goodness, I thought the flames and the smoke would be their main problems, but sheer exhaustion must be a major issue too. Actually I think I may have gotten that wrong – because I talked to another firefighter friend of mine and he said they do 24 hour days with 16 hours work, 8 hours of sleep/rest. I had written Joe to see if that was in fact what they did as well, but have not received a response yet (not surprising as I am sure he is quite busy with more pressing issues). I can’t imagine working 1 hour in those conditions. These guys are amazing!!!!! My goodness, that’s even worse! They’re a hardy lot. Fine reporting and camera work, SD. You took us to a place none of us want to venture. We all are fortunate for folks like the appropriately named Joe Goforth and his colleagues that do that dangerous work. I wish you rain and the end of your drought. Thank-you my friend!!!!! The weather it is a-changing. It is presently 64 degrees and freezing. Hopefully it won’t be long before the rains begin. Wow, your temps are comparable to our temps right now. Enjoy. Only diff: I’m thinking warm and you’re saying freezing. 😉 Now, please rain out there, Mother Nature.